Ulm was high on my list of games to try at Essen after doing a bit of preview work prior to leaving for Germany. After reading the rules to the game, I was immediately attracted to the action selection mechanism in the game. As it turns out, I never got a chance to play the game at the show – though I did manage to play a different Burkhardt game at the fair – one with its own inventive action selection mechanism (Kilt Castle from Zoch). In any event, Ulm places the players in the medieval city of Ulm – at a time when the cathedral is being built (sometime in the 1500s). Ulm is a free city in the Holy Roman Empire and there is a bustling trade going on down the Danube. 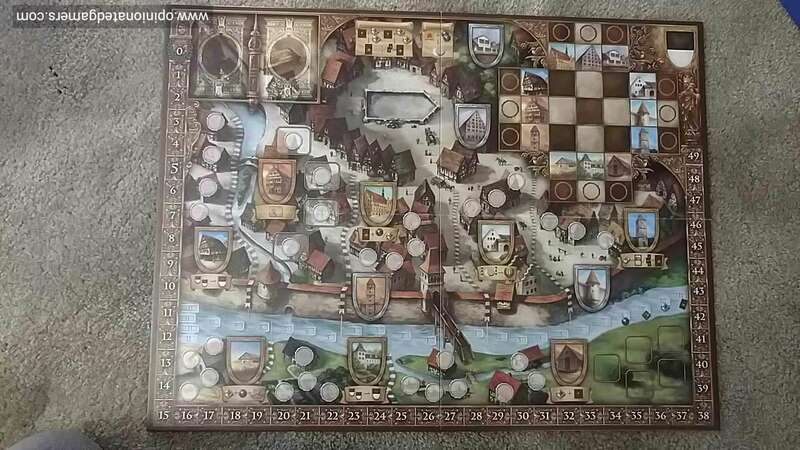 The board shows the old city with the river running along the bottom of the board. The cathedral is built and placed on the appropriate space on the board. 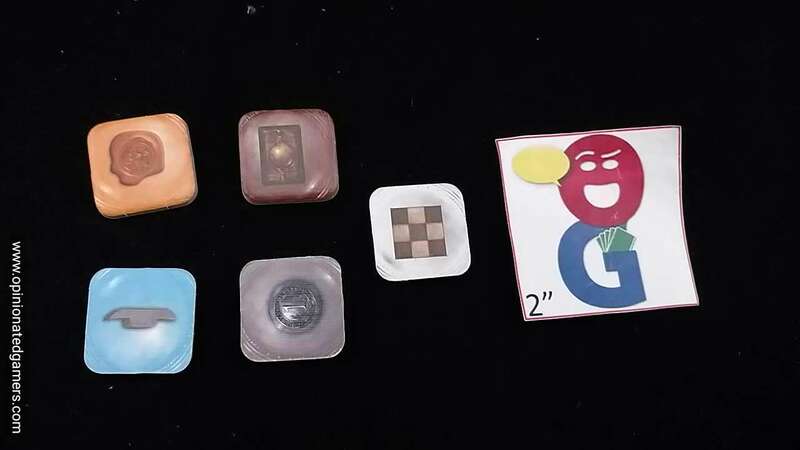 There is a 3×3 array of action spaces near the cathedral, and a prescribed set of action tiles are randomly distributed on those 9 spaces. 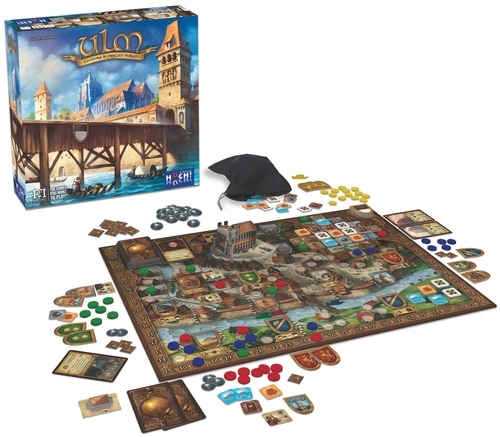 Each player takes the pieces in their color and places their boat on the first space of the Danube. The game is played over 10 rounds. The starting player takes a Tower tile and places it on the Cathedral. Then, each player takes a turn. First, an action tile is drawn from the bag and then it is placed next to any row or column in the action array and then pushed into the grid. (If you do not like the tile that you drew, you can discard a Sparrow token to exchange your drawn token with any from the docks area.) This will result in one tile being pushed OUT of the grid. The player now takes the three actions depicted in the row or column where the new tile was just introduced. The actions can be taken in any order. The tile which was pushed out of the array is NOT used. Card Action – discard any 2 Action tiles from your personal supply and take the topmost card from the pile. If you discard 2 tiles of matching color, you draw the top two cards from the deck and choose which one to keep. If you choose not to buy a card, you can use this action to play an additional card on this turn. River action – move your boat one space forward on the Danube. You only count spaces that are unoccupied. If you do not have the resources to take an action in your chosen row (i.e. not enough action tiles to draw a card or not enough money to place a seal), you will forfeit that action. At any point in the turn, the player also has the option of playing an action card whenever it makes sense. There are two ways to get cards – you can buy them with the card action from the array or you can get them as a special action in a few regions for placing a seal. 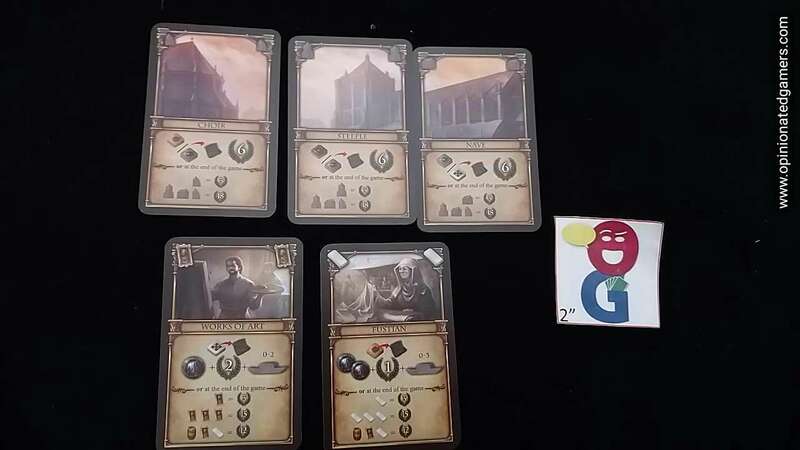 Each of the cards has two different actions on it – an immediate action on the top portion of the card and an endgame bonus which is found on the bottom. When you choose to play a card, you choose which action you want – if you discard the card, you take the immediate action. If you play it in front of you, you keep it there until the end of the game when you will take the end game bonus. Again, the game ends after 10 rounds. At this point, there is some end game scoring. Most players will have some VPs gained during the course of play. 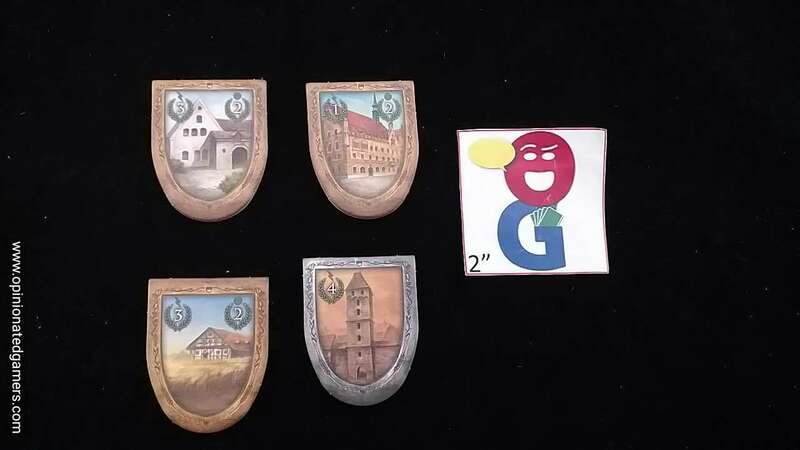 These are gained from playing cards, some seal special actions, and from some of the city coats of arms. At the end of the game, you score one VP per sparrow token collected, you score points (or lose them) based on your river position, and you score points for the cards which you have kept in front of you. Ulm feels like a throwback game; something that I might have played when I first got into Euro-games. And, by saying that, I’m in no way denigrating the game. The game is solidly constructed with a number of interesting mechanisms. The one that stands out to me is the action selection system. I like the way that you can choose your set of three actions (to a degree) from the grid. As you only get ten chances at the grid, you really have to try to get the actions that you want on your turn! While you’d ideally like to balance your actions, sometimes you have to take what the grid gives you… it is possible for you to only have one valid option of row choice in the action grid. The majority of the points come from the seals, cards, and river actions – but you still have to take tiles and money at time to give you the basic resources needed to do the other actions. So, you’ll always want to take four or five actions in a row, but you’ll have to mete them out three at a time, and after you’ve chosen a set, you just have to hope that the actions you still want to do will be available to you on your next turn. Having some sparrow tokens available can help mitigate the luck of the draw so that you can at least guarantee yourself one action that you want to do – but the challenge of the game is getting to do the things you want to do WHEN you want to do them. In our first game, our group all thought that we needed to get to the end of the river to get the endgame bonus for river position. What ended up happening is that we were all at the right edge of the board by the seventh turn, and as a result, we didn’t have many seal actions left to choose from. In my next game, I actually chose to hang back, and when others zoomed past me, I was left with my choice of the seal actions from the start of the river. I barely made it past the bridge, but I think that I made up for the loss of river scoring by being able to take multiple seal actions at the earlier locations. The artwork is nicely done in the individual sense – I like the look of the cards and the seals. The 3D cathedral is also nice. However, I’m not a big fan of the board as a whole. It’s super busy, and there is so much going on in the artwork that it’s hard to see all the details at times. The rules are split up between two rulebooks. I think that between them, all of the rules needed to play are given to the gamer, but it’s not particularly easy to look something up because you have two different places to look. I know that the idea was to give you a single rulebook which gives you overview of the gameplay and then the chronicle book which gives more specific examples and descriptions of the components – but I think that there are lots of things that can be missed because of the dual sources of information. One example would be the use of the Sparrow token to replace a drawn action tile. Even though I read both of the rulebooks twice prior to our first game, I never put the two pieces of information together because they were each in a separate book. The actions of the Descendant tiles also really make no sense as they are only mentioned in the setup of the rulebook and then in one sentence in the scoring area. All other information about them is in the secondary book. When learning or teaching the game, make sure that you have both rulebooks open. Lorna: The grid mechanism and the limitations with it are very interesting. Unfortunately I didn’t find the rest of the game as interesting. The icons were also very tiny especially the ones you place in the cathedral. Agree that the dual rulebooks were more of an impediment to play than helpful. Karen M: The graphic design of the board is a real turn off; it makes it hard to see the important parts of the board. I really enjoyed the action grid selection part of the game, but the rest of it was just not that interesting. I’d like to play again and resist the urge to zoom down the river at breakneck speed but I have a feeling it will just be a bit better. Dan Blum: I’ve played once on the actual game and once on the prototype (very similar if not identical to the published version) and so far I rather like it. I agree with Dale that it does feel somewhat old-school, but I happen to like that sort of thing if done well, and this is done fairly well. The graphic design is definitely too busy and I agree that the dual rulebooks tend to confuse things. However, I’d still like to play again. It’s also nice to see something I like from Burkhardt, who has had a fairly long career without a lot of standout designs. 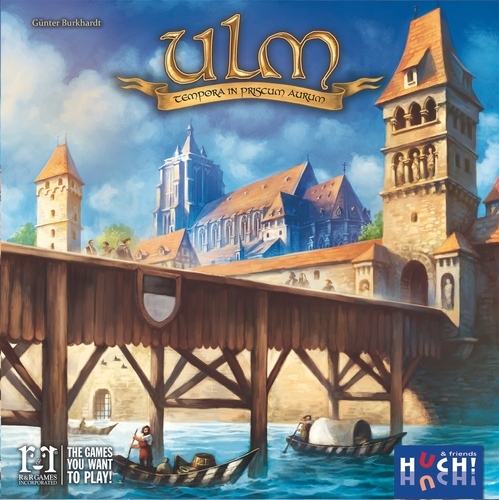 Ulm is probably my favorite title from Essen … so far. It does have that “old school” feel to it, which is probably why I enjoy it so much. There isn’t the effort to throw in more than one can handle, which seems to be the trend with many designers. The action selection mechanism is brilliant and there are tough decisions to be made each turn. The two rule book approach is ridiculous, and the board is definitely cluttered. These drawbacks are overcome by a very good game.